Bernice & Erik traveled all the way from Hong Kong for their Banff winter elopement at Two Jack Lake! With being so far away, they hired Banff elopement planner Something New Weddings to make the process easier! They had a beautiful ceremony overlooking Two Jack Lake which was having ice quakes that day and the booms were just shaking the valley. If you’ve never heard that sound before, it’s a little bit unsettling! November is a great time of year to get married in Banff because it’s not terribly busy so there weren’t a ton of people hanging around Two Jack Lake for their ceremony. With it not being super busy, we also got to shoot in the middle of the road for their Banff winter elopement to get Cascade Mountain in the background… and we weren’t terribly worried about getting run over either! We ended their photos at Cascade Ponds and these two decided they wanted to lay in the snow for photos! Crazy! I love how it turned out though, but so chilly! THese are some of my favourite photos from Bernice & Erik’s Banff winter elopement! Are you newly engaged and are looking for Banff winter elopement? I would love to photograph your elopement or intimate wedding in the Canadian Rocky Mountains! Please get in touch for more information on Banff elopement wedding packages or for other mountain wedding destinations like Canmore, Kananaskis, Emerald Lake, Lake Louise, Peyto Lake or Moraine Lake. If you aren’t looking for to do a Banff winter elopement, I also do vacation portrait sessions in the area! Looking for more Banff winter elopement inspiration or other mountain winter weddings? 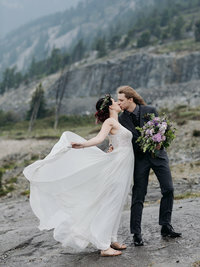 Check out this Banff elopement at the Juniper Hotel! Or this winter elopement in Jasper! 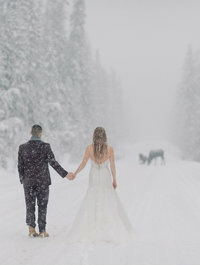 Try this winter elopement in Canmore! Or this winter elopement wedding in Banff! Take a peek at this intimate winter wedding in Emerald Lake! Or this Jasper Park Lodge winter wedding! 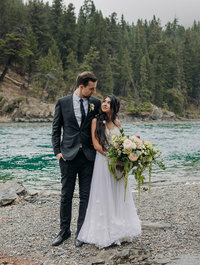 Try this winter boho elopement in Lake Louise! Or this Creekside Villa winter wedding in Canmore! Don’t miss this Banff wedding Parade! 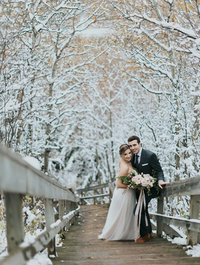 Or this Lake Louise winter elopement!